If you ever did any schedule creation prior to the two new PowerShell cmdlets (New-CMSchedule and Convert-CMSchedule), then you probably already know how tricky it was working with scheduled tokens and are going to welcome these new cmdlets. In this blog post, I am going to show you how easy it is to use New-CMSchedule to create a weekly recurring schedule. If you open the collection properties up using the console, you will notice that you now have a collection called TEST-Collection Schedule and it has a custom refresh schedule like the one pictured above. 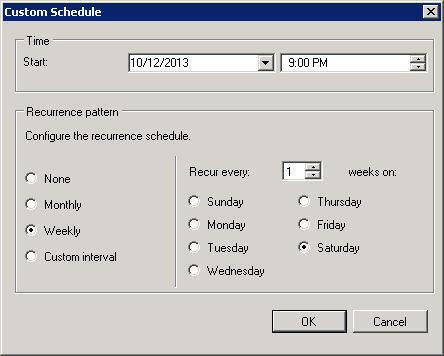 This is just one example on how easy it is to create schedules in ConfigMgr using the New-CMSchedule cmdlet.